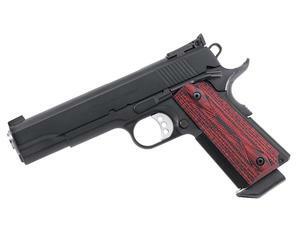 The Ed Brown Executive Target features a 5" Government model slide, single stack government model frame, Carbon steel frame and slide coated with black Gen4 for low glare, superior rust protection, and improved wear resistance, Adjustable rear sight buried deep into slide, cross dovetail front sight and chambered in .45ACP. Carbon steel frame and slide coated with black Gen4 for low glare, superior rust protection, and improved wear resistance. Traditional "square cut" serrations on rear of slide only, top of slide is flattened and finely grooved at 40 LPI.